Sterling Children's Books, 9781454929284, 22pp. Welcome to Christmas in the Land of Lincoln Kids can celebrate the state of Illinois with such fun things as 11 Midway monsters, 6 roadside giants, and a cardinal in a white oak tree. Gina Bellisario grew up in IL, and now lives in Woodridge with her husband and twin daughters. She is the author of the Ellie Ultra series from Capstone. Visit Gina online at ginabellisario.com. 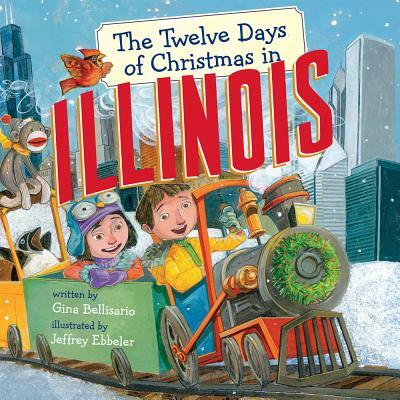 Jeffrey Ebbeler has illustrated more than 40 books for young readers, including Sterling's The Twelve Days of Christmas in Ohio, by Carole Gerber. He gives many lectures and demonstrations in grade schools, colleges, and museums, and attended the Art Academy of Cincinnati, the city where he now lives with his wife and twin daughters. Visit Jeff at jeffillustration.com.